The glycerin in handmade soap is said to leave a thin layer behind even after being washed off. This is a good thing because Glycerin is a humectant (it attracts moisture from the environment to your skin). It is not added to handcrafted soap; it is a natural by-product of the soap-making process. In fact, if your soap develops small dew drops of glycerin during times of high humidity, don't worry... it's doing it's job! Handcrafted soap has no petrochemicals, toxic detergents, or synthetic fragrances and dyes; which dry out and irritate skin. Avoiding toxins in even a small area adds to a healthy lifestyle and a youthful look! Fewer Chemicals & Kimberley Rose! Handmade soap is made with natural oils, moisturizing butters, organic botanicals, detoxing clays, and Essential Oils that are known to have antibacterial, antifungal, antimicrobial, and anti-inflammatory properties. At Kimberley Rose we take pride in using these high quality, food grade ingredients. Check out our variety !!! You may have noticed that Handmade soap does not have the same lather as Shower Gel. Due to its lack of chemicals that create artificial bubbles and its properties of high moisture the bubbles are creamier and smaller. Although less lather does not mean less clean, as many believe; there is a solution!!! Simply use the old fashion friction of a mesh pouf or a natural loofah to bring up larger, frothy bubbles that some of us love and enjoy! 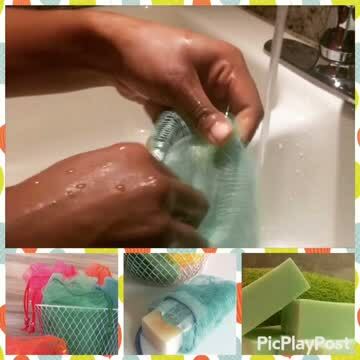 Watch the video to see how much the soap lathers up in less than 30 seconds by using this soap saver pouch....Wait for it!!! This pouch can also be used to save soap; as you leave it inside the hanging pouch to air dry between uses.